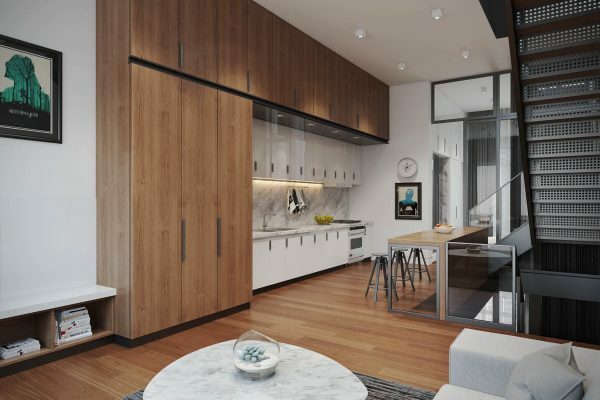 Keeping wild aspirations in check can be difficult when viewing compact modern homes on the market. 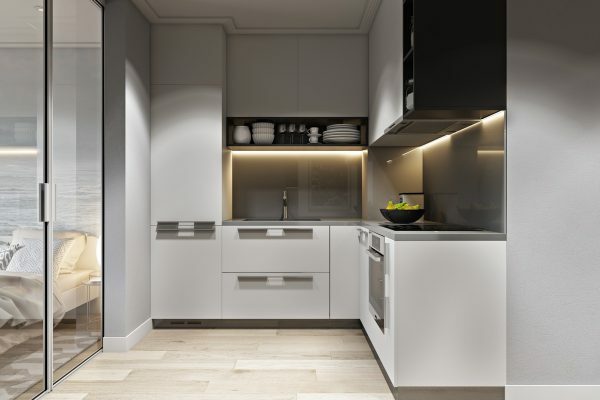 All can be going swimmingly until you walk to the end of a hallway and ask “Where is the kitchen?”, and the real estate agent opens out their arms and says “This IS the kitchen.” Before you head for the exit, consider that small CAN be beautiful. 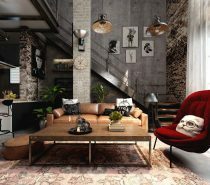 Limited dimensions set challenges in creating a functional and stylish space it’s true, but the two goals are achievable in tandem. 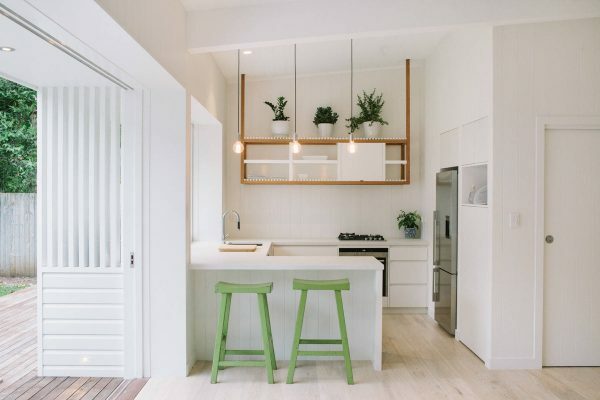 These 50 small kitchen designs bring tips on how to make a shining gem out of restricted cooking space by thinking outside the tiny box. 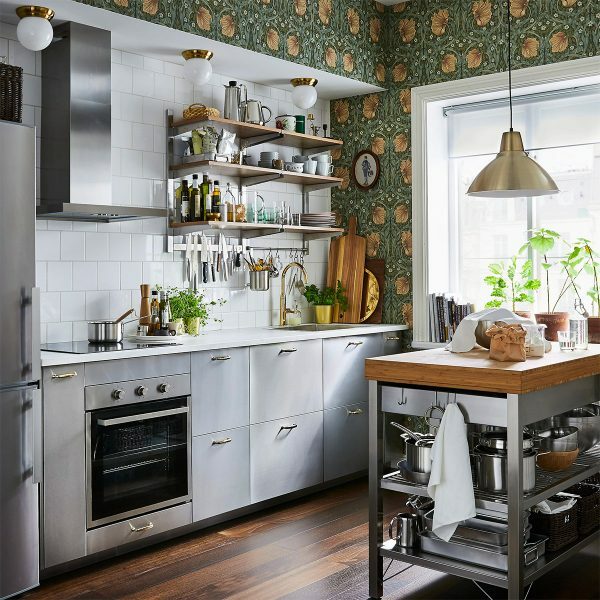 Jazz up old kitchen tiles with patterned stickers. 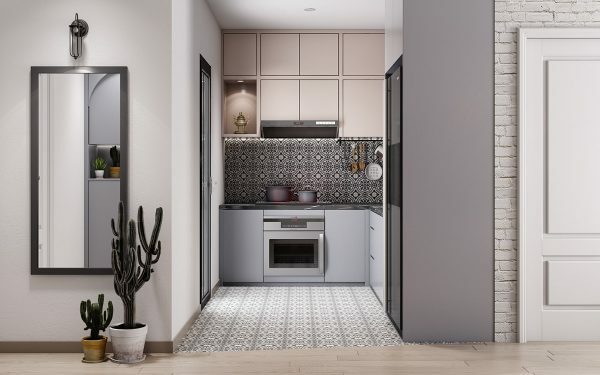 Our first small kitchen design is covered in intricate monochrome wall and floor tiles that draw you into the compact space. 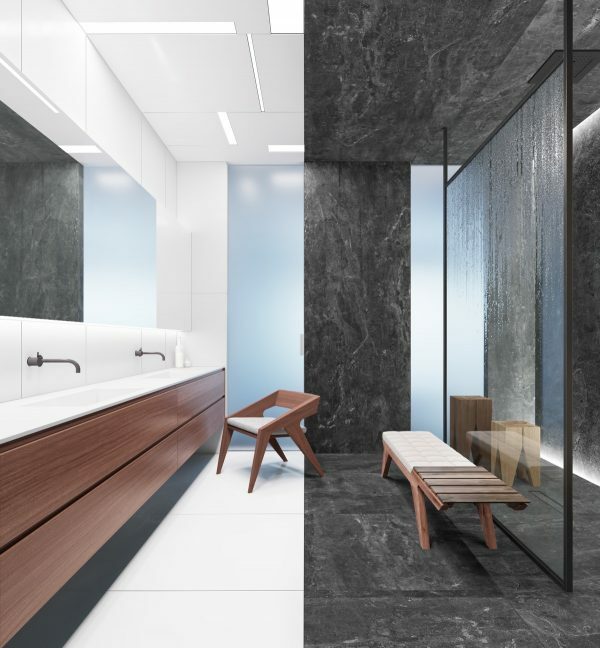 You don’t have to start from scratch to achieve this look though, tile transfers are a quick and cost effective way to transform an existing tiled backsplash. 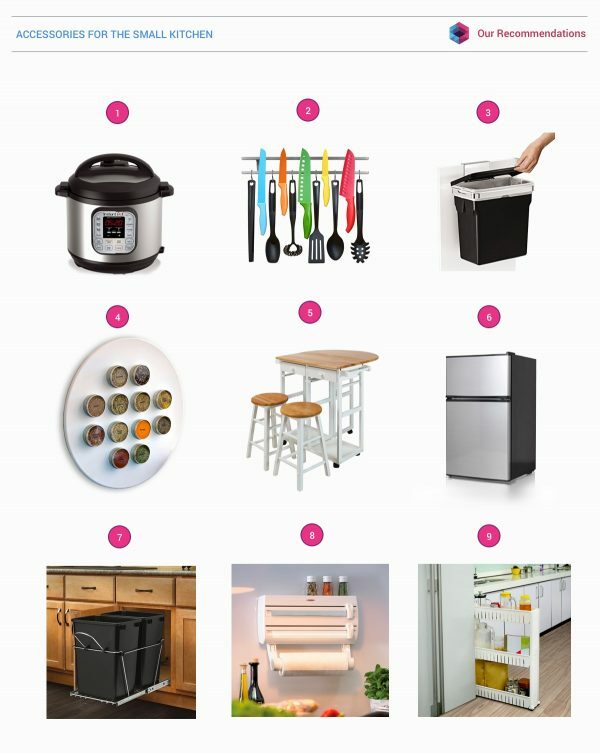 Free up drawer space and decorate the walls with useful kitchen tools. This magnetic wall mounted knife holder keeps kitchen knives out of limited small kitchen organization trays, and instead moves them up on display. In this small kitchen remodel, the display complements the sharp design of a geometric backsplash. 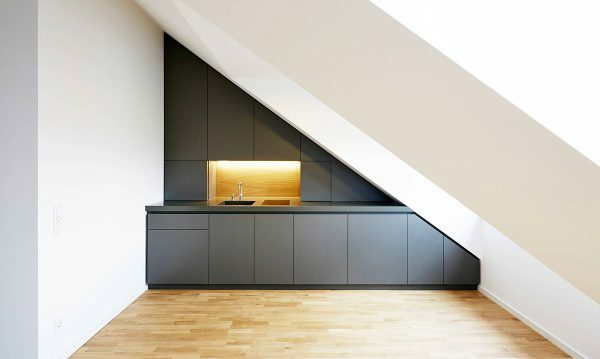 Create a recessed kitchen nook. 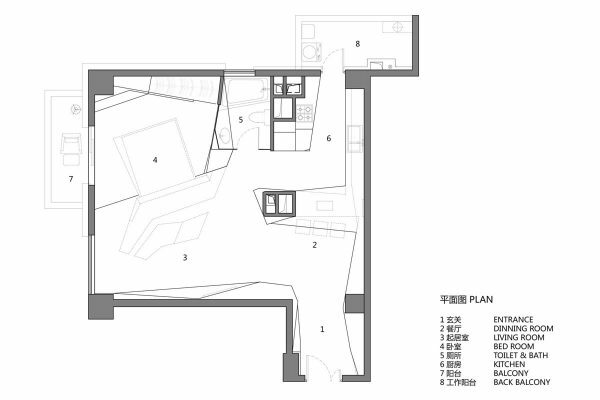 This one-wall kitchen layout is set within a dividing wall of a studio apartment. 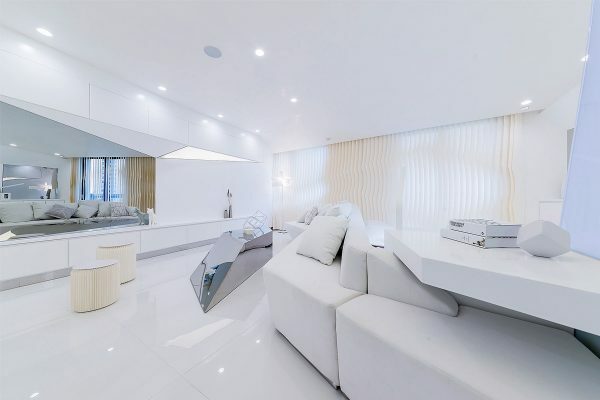 The recessed design hides the kitchen cabinetry away from the rest of the open plan space, resulting in almost a separate room. 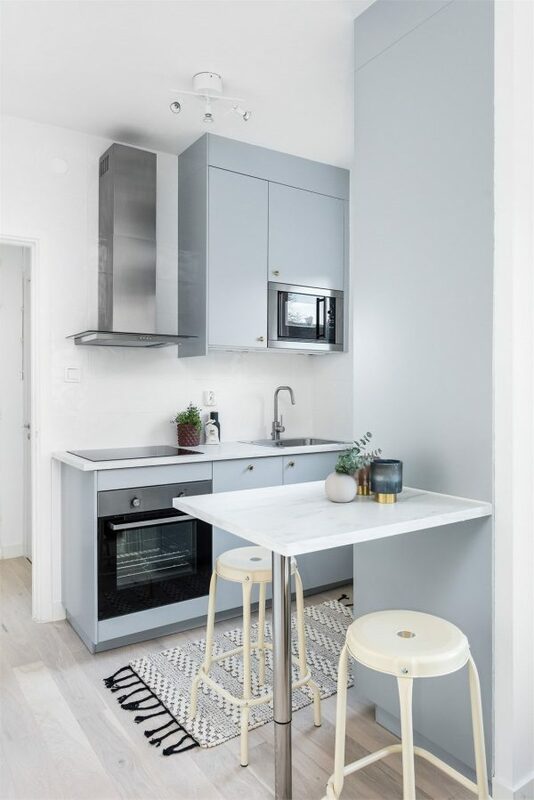 Source small kitchen appliances to maximise bench space. 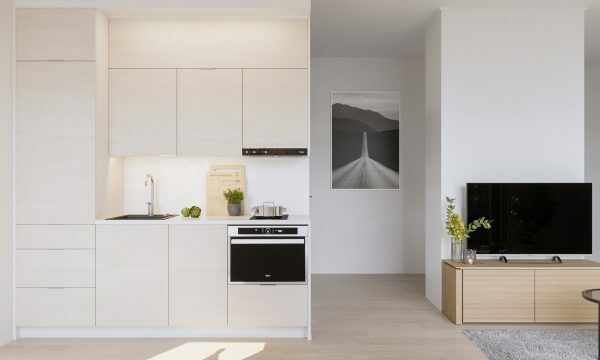 A two ring induction hob leaves extra space for dishes and prep in this small modern kitchen. The tiny extractor canopy leaves wall space looking more spacious too. 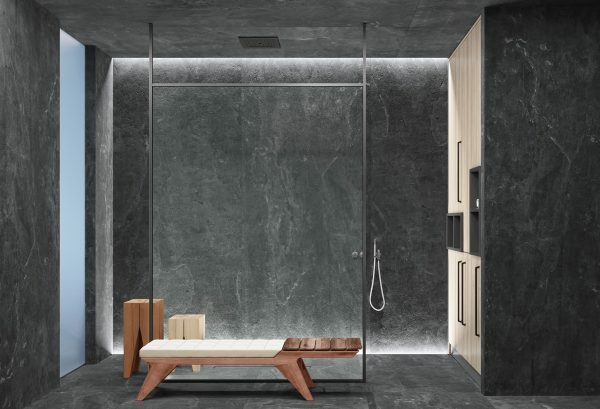 Add luxurious finishes. 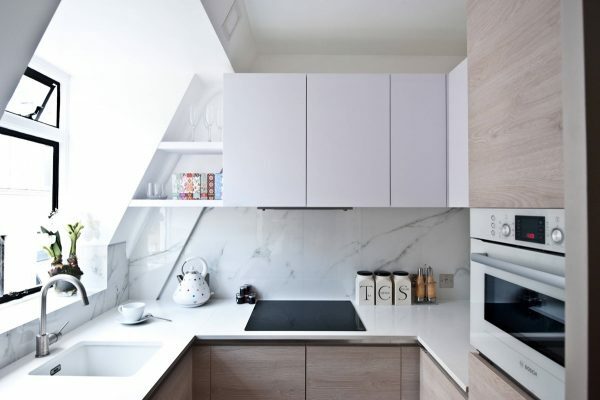 This marble kitchen backsplash creates a look of sophistication through the centre of contemporary white cupboards. 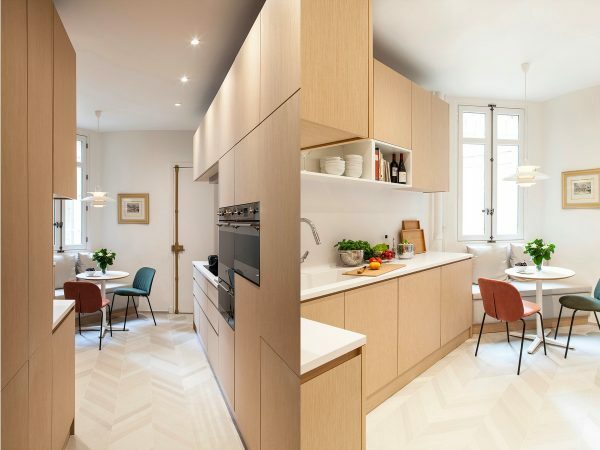 Larger wooden storage cupboards flank the end of the kitchen run and span the upper space, creating a warm frame around the cool scheme. Inject a little colour. Beautiful traditional tiles bring a stripe of joy into this L shape white kitchen design, complemented by a classic teapot. 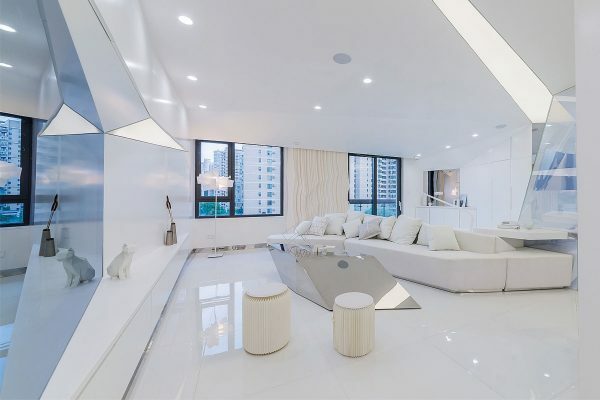 Install an eye-catching centrepiece to distract from limited room dimensions. 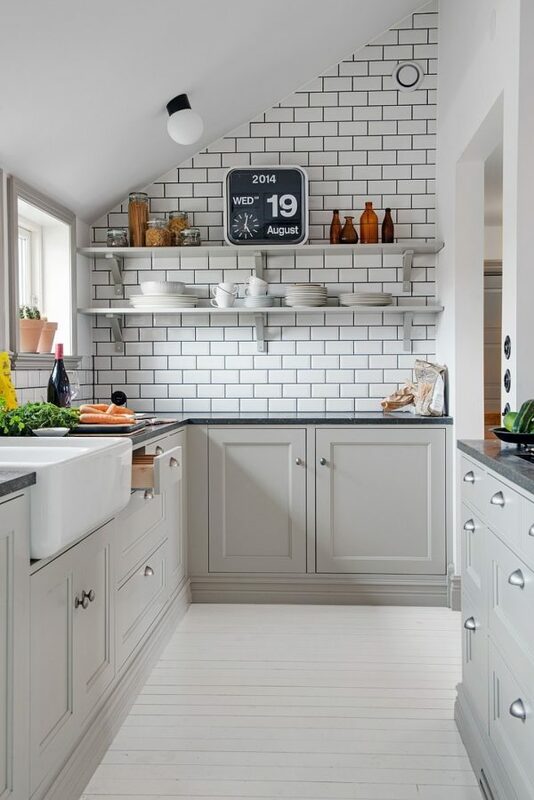 A large kitchen clock is an ideal piece to draw the eye, and it also serves a practical function. The chunky retro analogue clock with calendar feature gracing these shelves is available here. This country style small u shaped kitchen also utilises decanters, storage jars and colourful dry foods to expand the display. 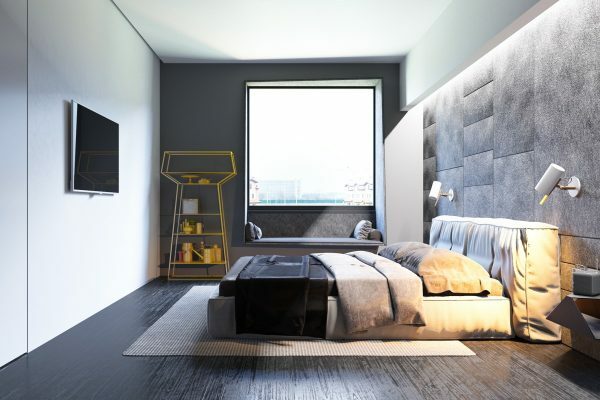 Double bank wall cabinets to make the most of vertical real estate. 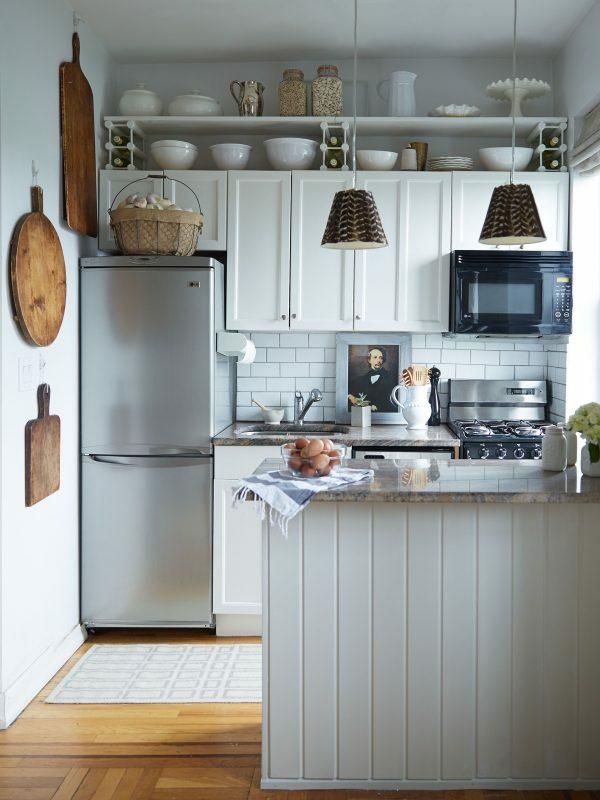 Adding in an extra row of wall cupboards can drastically increase your small kitchen storage space. Give kitchen items a dual use. 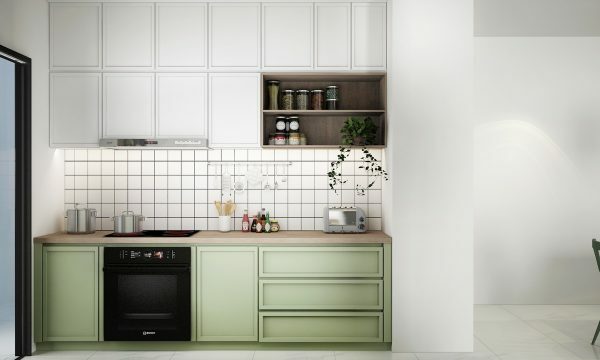 This hard working little space offers up a number of small kitchen storage ideas. Mini wine racks hold up ceiling skimming shelves, a glass mixing bowl doubles as a fresh egg holder, and a water jug sidelines as cooking utensil storage. 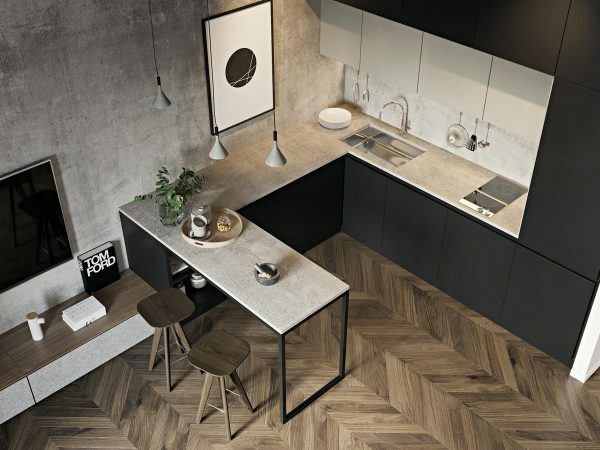 The simplistic wooden bar within this black and white kitchen can be used like a small kitchen island for cooking prep, or as a small kitchen table for dining. 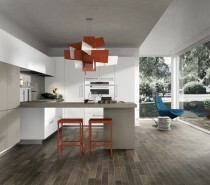 Two low hanging kitchen pendant lights give its placement more prominence and permanence. 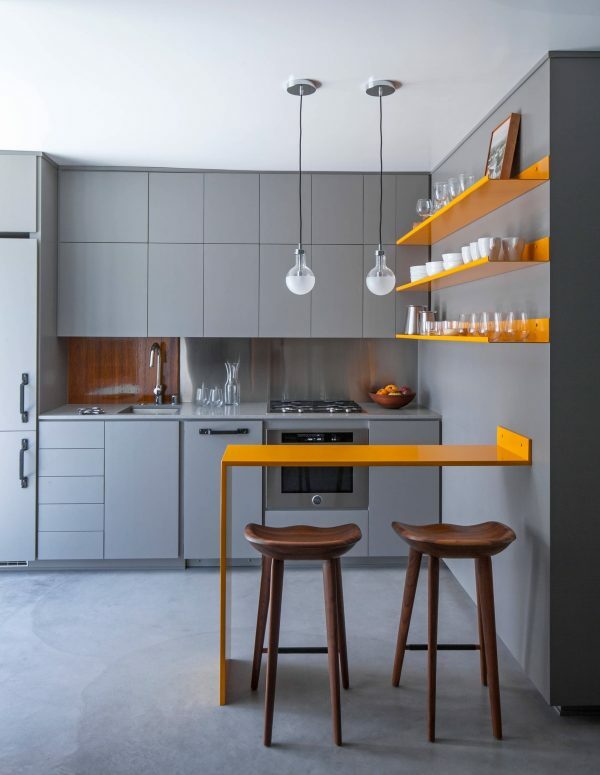 In this colour injected grey kitchen, a bright yellow small kitchen island with seating sits below statement shelving that holds wine glasses within easy reach. 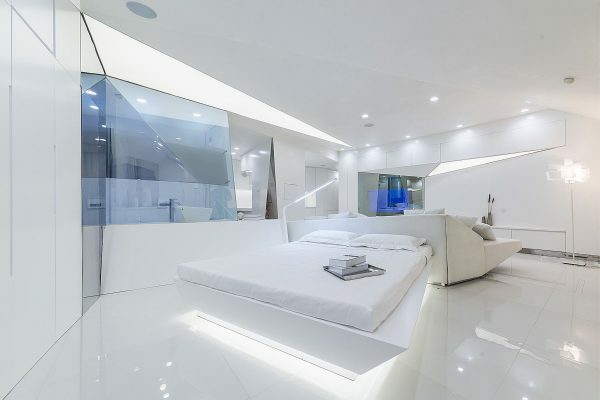 Get creative with lighting. 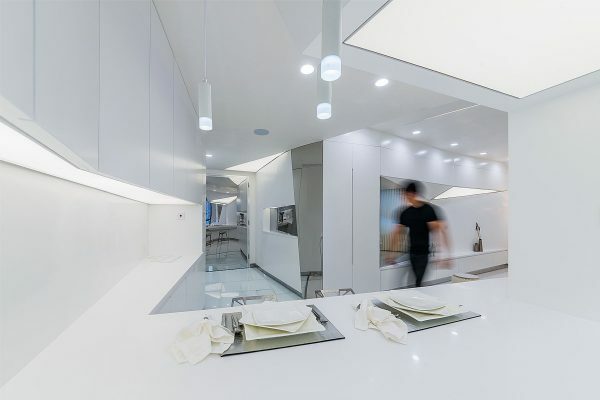 LED strip lights create a glow around these wall cabinets, causing a floating effect. 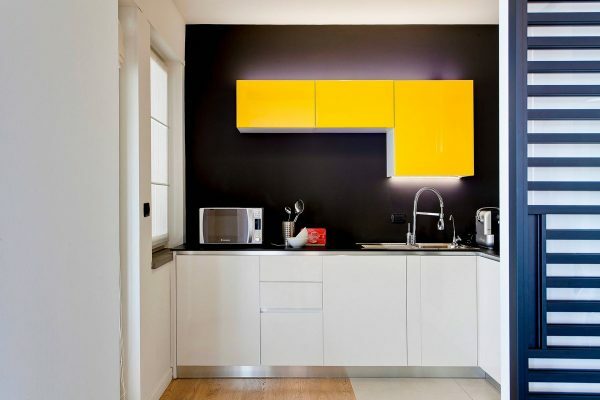 The colour of your units can brighten too; yellow accent kitchens make an uplifting choice for a shady little spot. If you can’t stand the heat, get out of the kitchen! 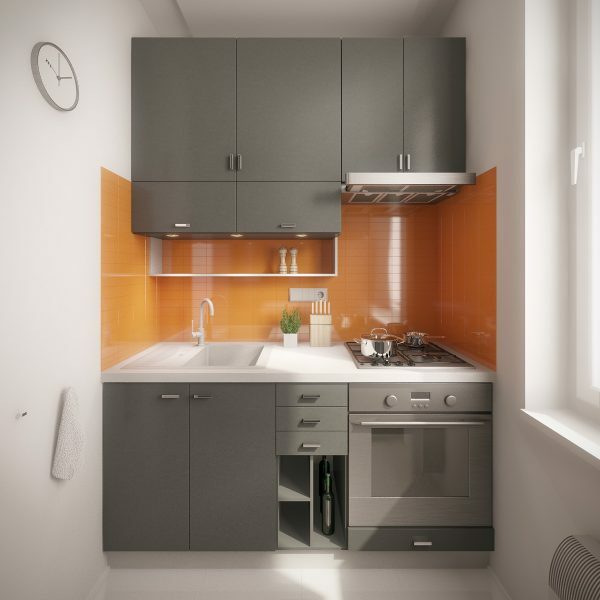 This fiery orange backsplash takes a grey small apartment kitchen up another level. 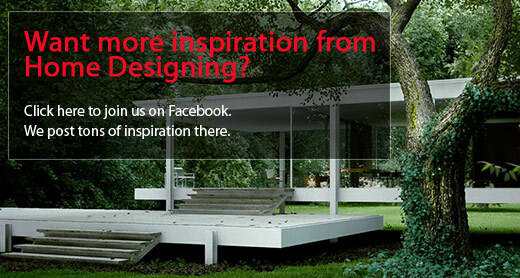 Choose slimline seating styles. Sourcing small kitchen table sets can be a tricky task. There must be enough room for the whole family to gather round but high-backed chairs can eat up a lot of space. 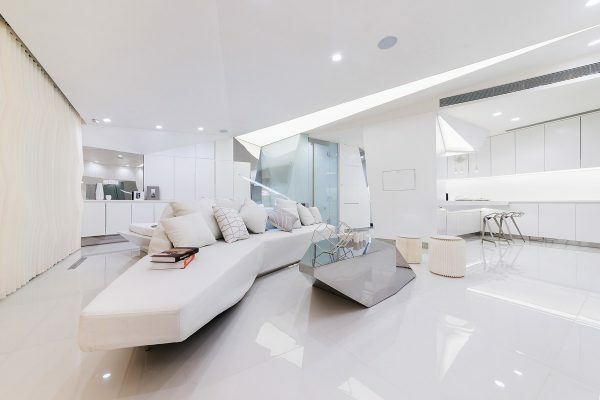 Consider stools instead; they can be pushed away completely beneath your table to maximise walkable floor area. 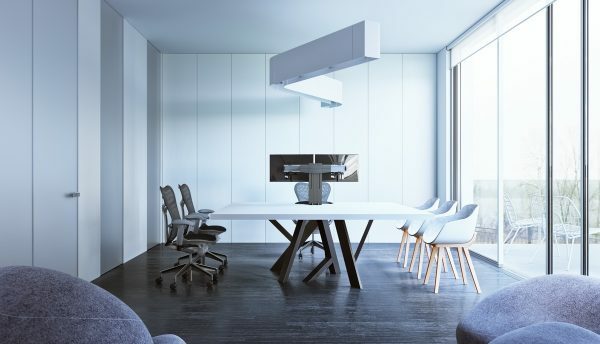 Look at tables that open on all sides too so that they can be pushed flush against a wall whilst offering leg space under all three remaining sides. Go handle-free. 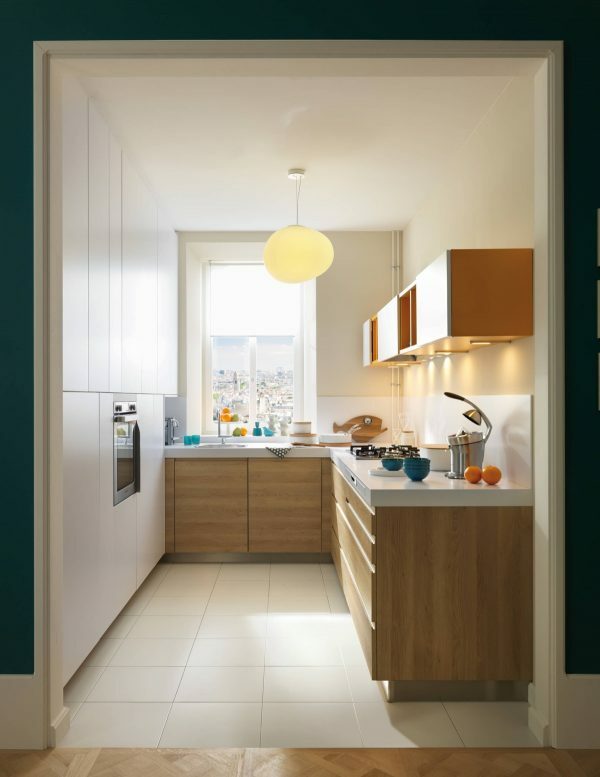 A handless kitchen has a far less fussy finish. There are also no pesky sticking out pieces to accidentally hook clothes on whilst passing by in close quarters. 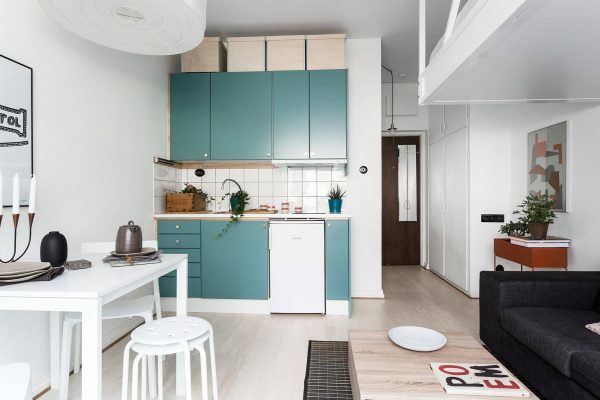 Particularly useful in corridor-like layouts like this green kitchen that leads straight up to a doorway. Use the art of camouflage. 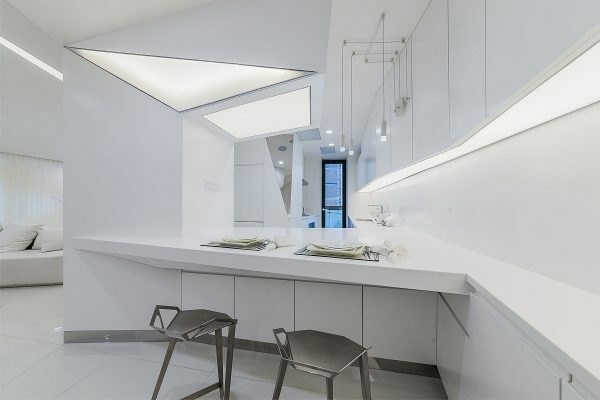 This minimalist kitchen uses white cabinets against a white backdrop to blend in. 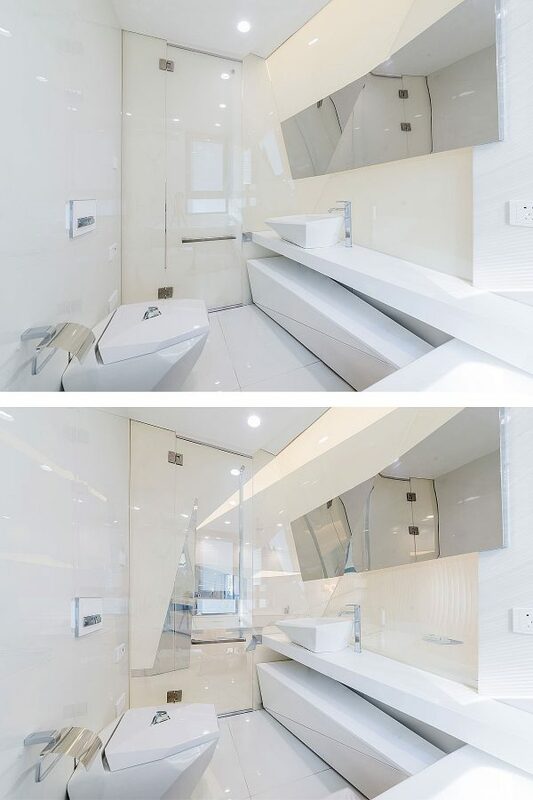 A soffit takes the line of the cabinet fronts right up to the ceiling for a smooth seamless finish. 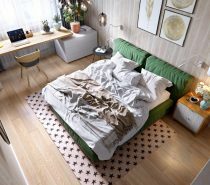 Make awkward shaped spaces work for you. 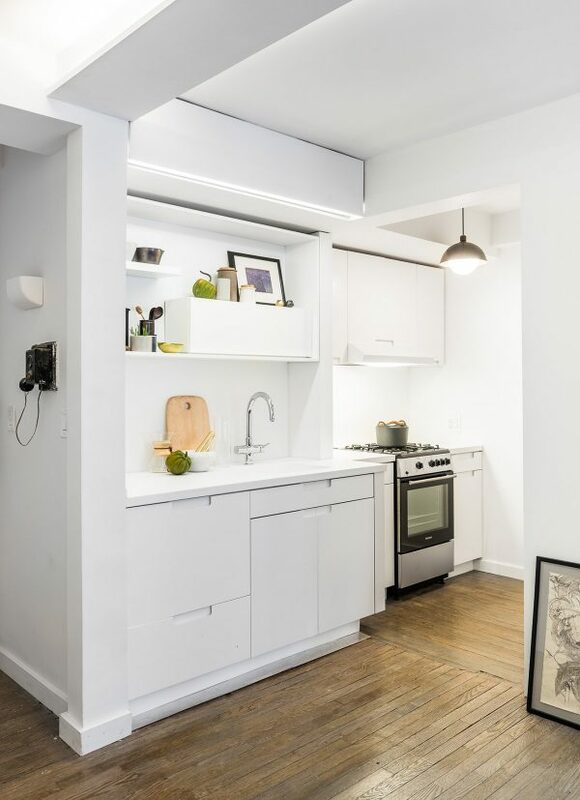 Install shelving below sloping eaves to squeeze out every last inch in small kitchen remodels. Another one below the eaves. This glowing small kitchen sink area is surrounded by bespoke grey kitchen cabinets that follow a sloping ceiling without a single gap. 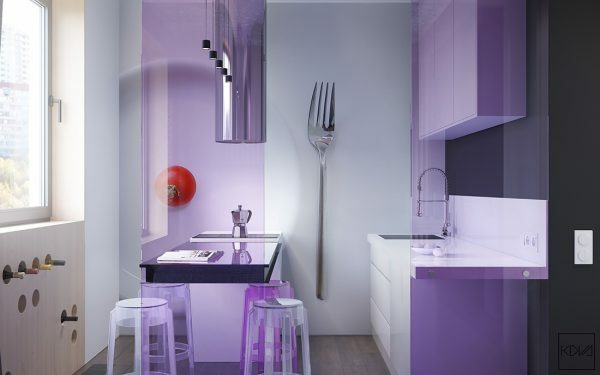 A small kitchen table and chairs can act as a partially dividing wall, like in this small galley kitchen. Go large on just one wall. 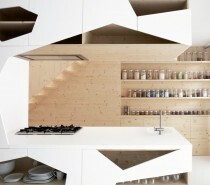 In this wood and white small u shaped kitchen, tall larder units have been restricted to just one wall. 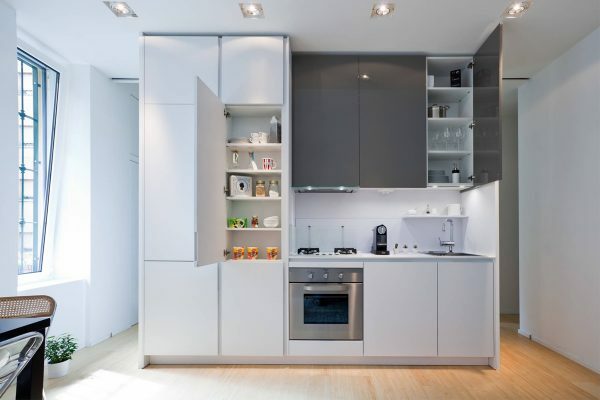 The taller cupboards are plain white so that they fall away from attention too. 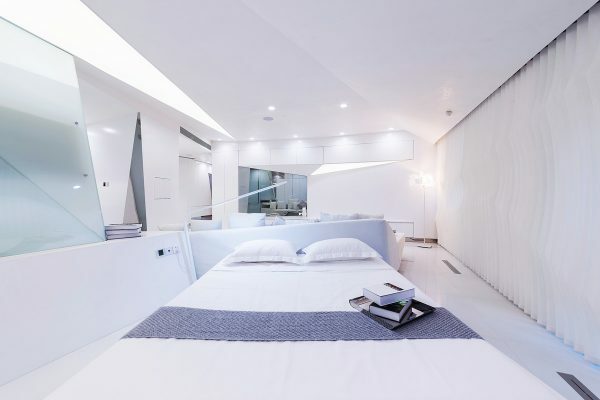 Use glass doors to create a sense of added space. The best thing about a tiny cooking space is that a small kitchen remodel cost is a lot less than its bigger cousins! 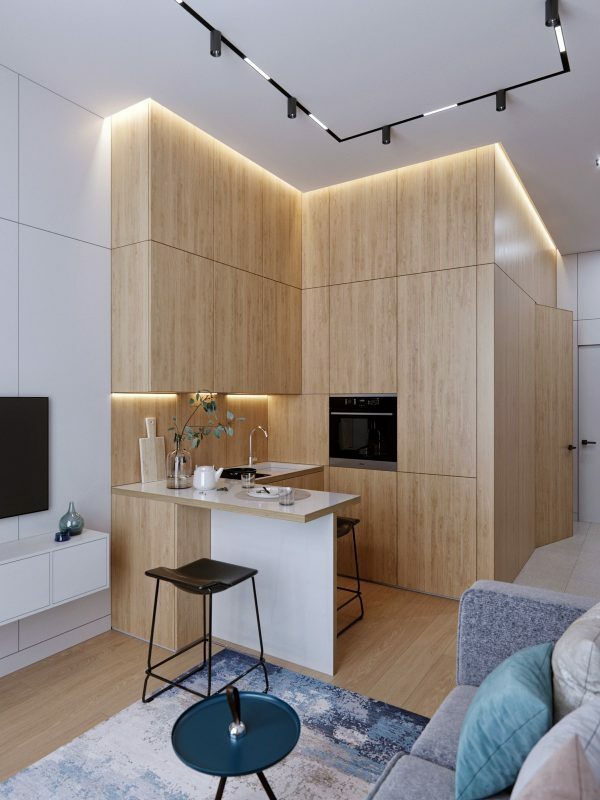 This means that you can opt for some high-end finishes, like the recessed ceiling lights around the perimeter of this tall but small kitchen layout. 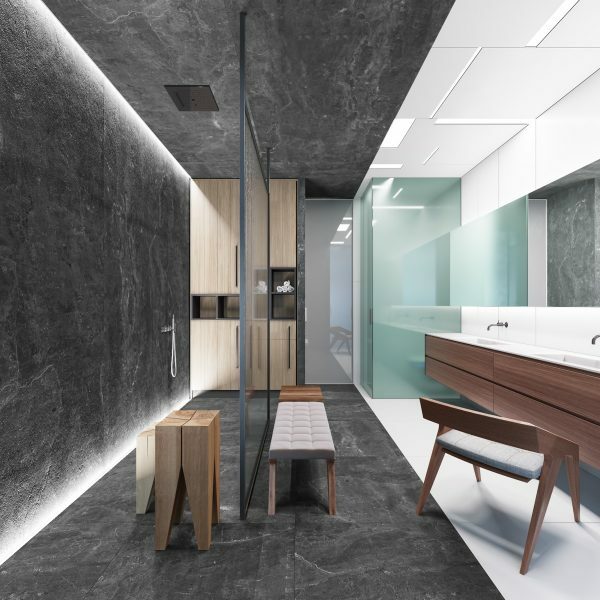 A couple of black kitchen bar stools anchor the lofty design. 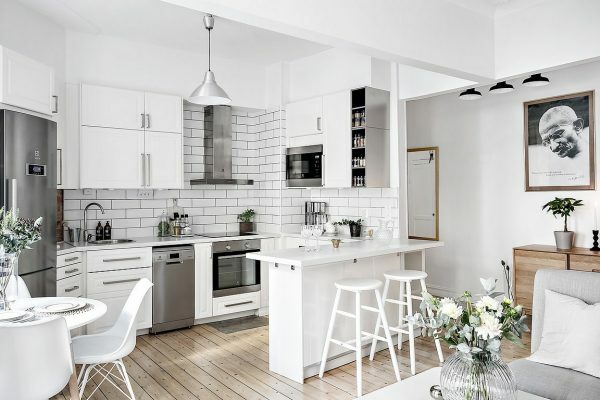 For more clean and crisp white kitchens like this one, check out these 30 Modern White Kitchens That Exemplify Refinement. 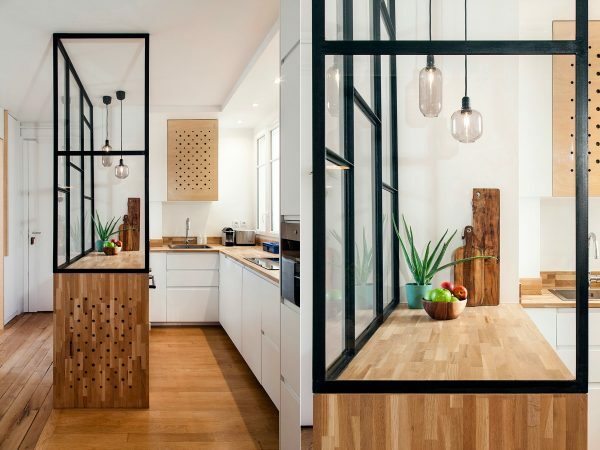 Another great example of how small kitchen islands can double as dining space. Plant a kitchen greenhouse window. If you love growing your own herbs but are pushed for sill space, then look up! 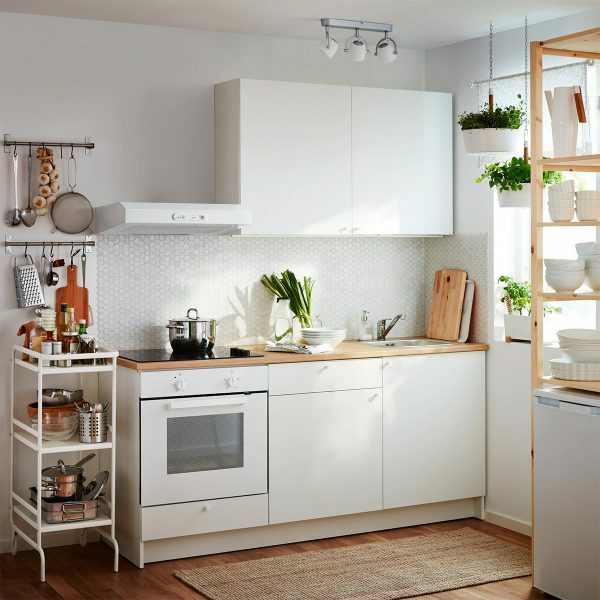 Be inspired by this ikea small kitchen; install a few rods across the glass to hang extra indoor herb planters right where they flourish. 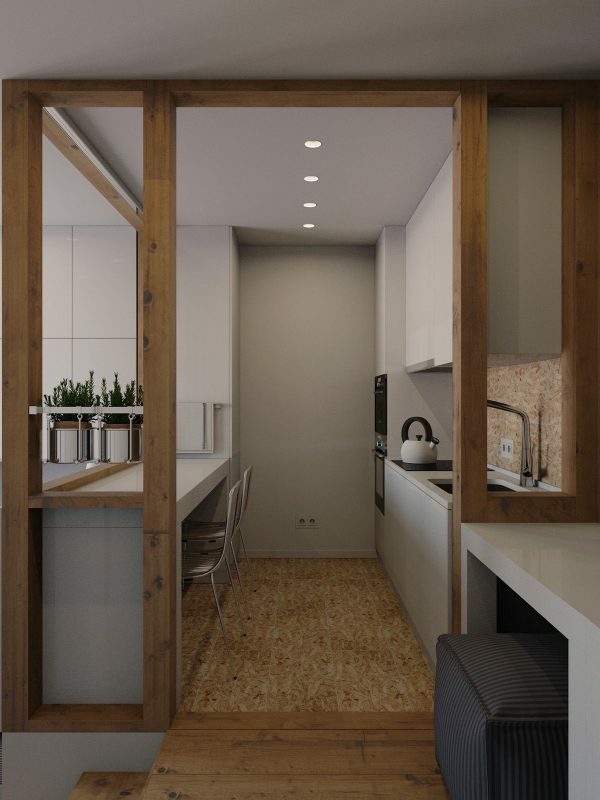 This small kitchen design incorporates hanging hook systems all over the walls too. A magnetic knife holder with hooks is an even more space friendly option. Paint kitchen chalkboards. 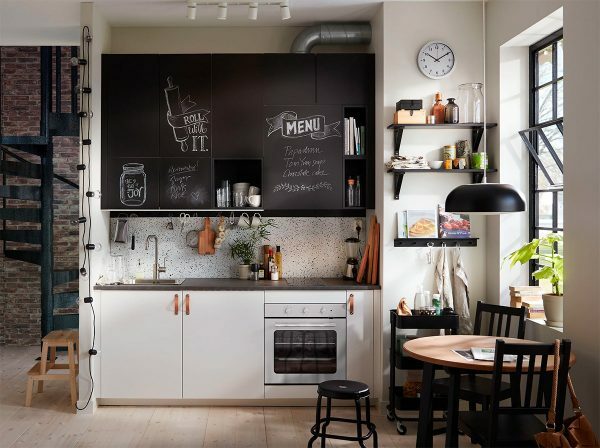 A chalkboard doesn’t have to take up wall space, you can splosh blackboard paint right onto your cabinets. Use your new writing space to jot shopping lists and display the weeks menu. 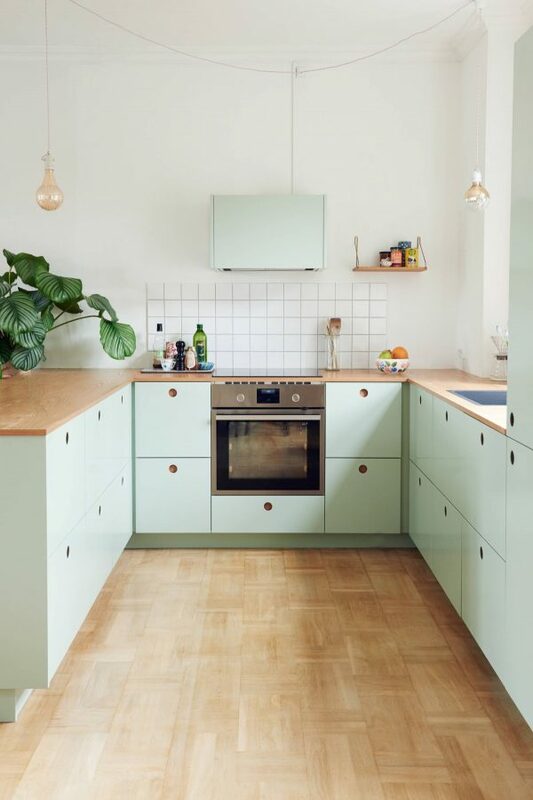 Cover a few small kitchen shelves too to match the look. A small kitchen stand offers a large amount of storage. 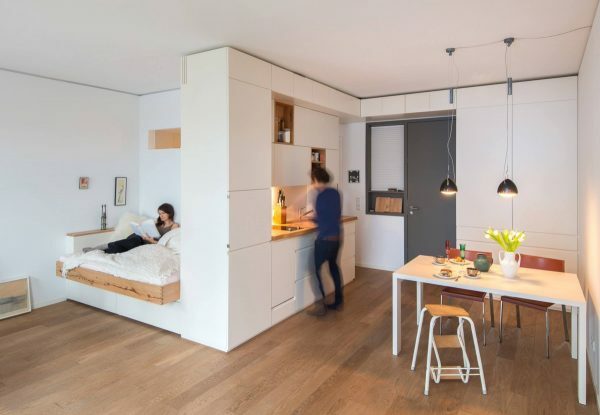 A stand or a small kitchen cart has a tiny footprint that can fit into a disused corner. This one tiny addition could solve your overspill problem and leave benches clear. 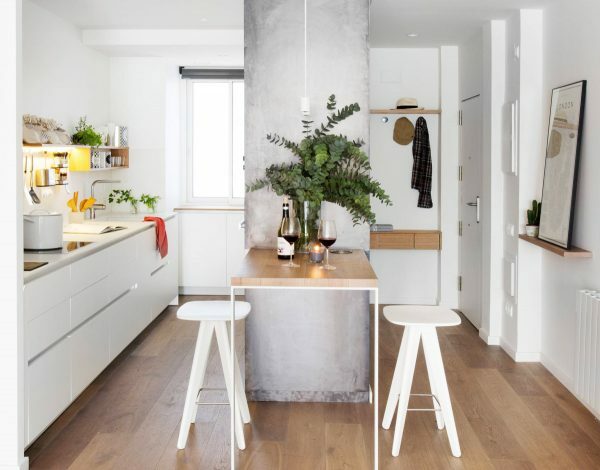 Unique hanging planters in this Scandinavian kitchen clear a little extra prep space too. Get busy! 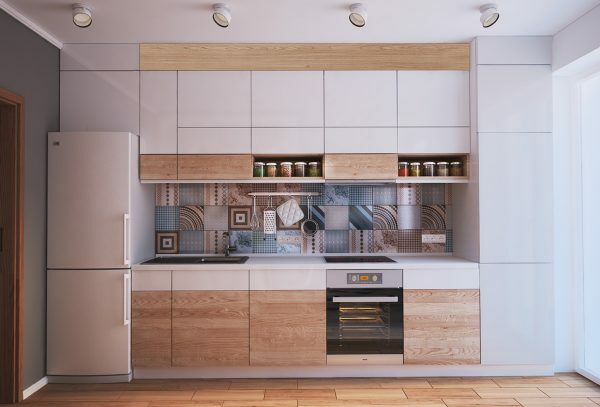 This stacked open kitchen shelving should look messy but instead it harmoniously matches with the busy wallpaper. The maple top kitchen work table stores a menagerie of items on display too. Use a-maze-ing pattern. 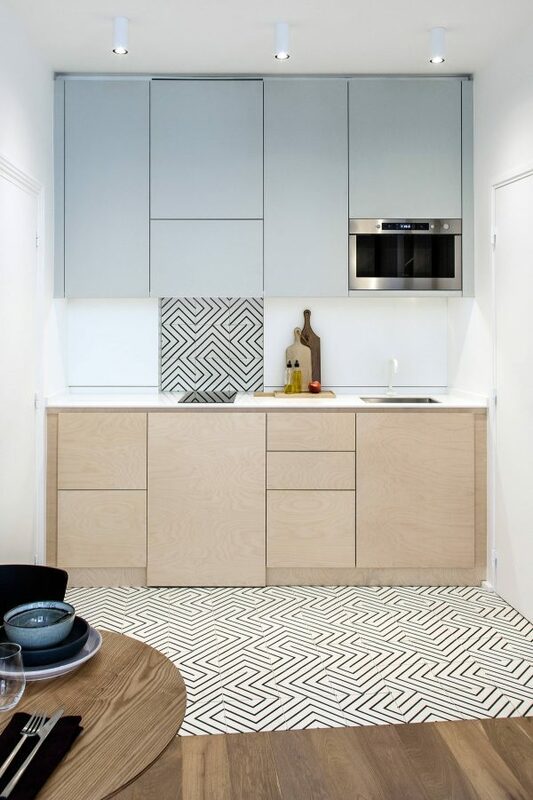 Ok, your tiles don’t have to have a maze pattern like these stunning monochrome examples, but strong geometric line works fabulously over small kitchen floor plans. 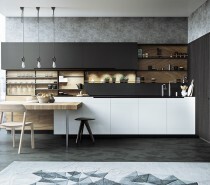 Light wood cabinets and cutting boards make a soft accompaniment to black and white decor. 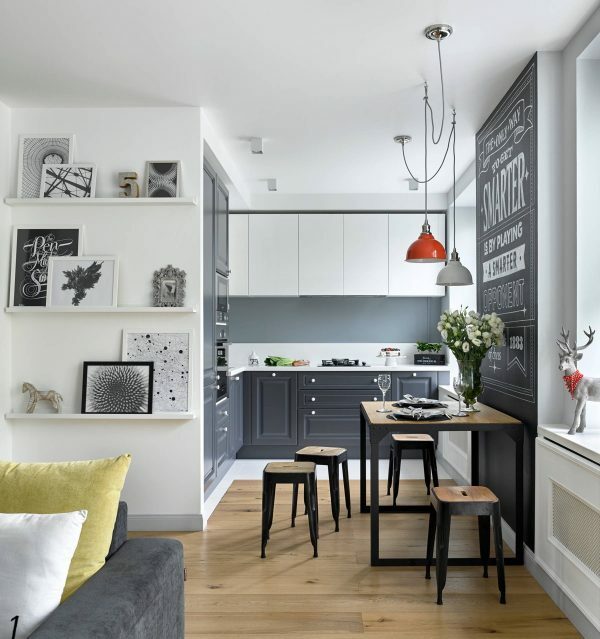 Small kitchen tables often work best as a bespoke built-in design. Think you don’t have room for a dishwasher? 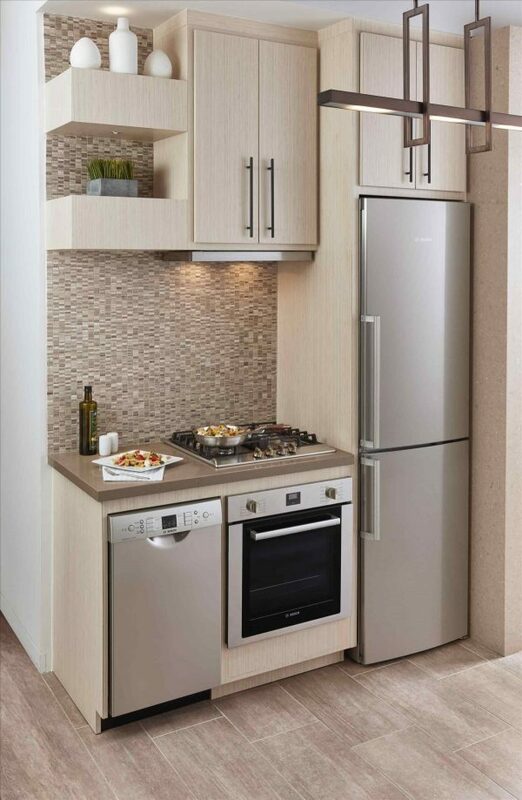 There are numerous slimline small kitchen appliances on the market to fit challenging spaces. Follow colour theory. Red is believed to enhance the appetite, hence why red is a popular choice in food packaging design. 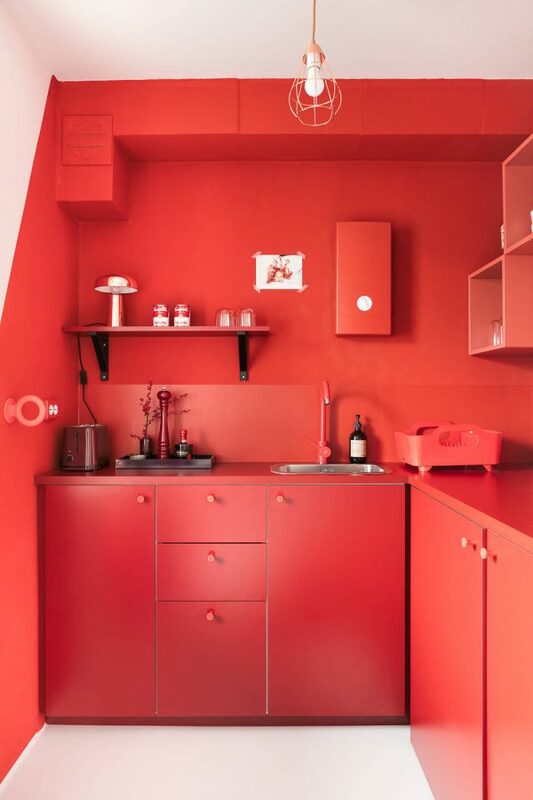 A red kitchen could get you in the mood to create more delicious dishes. You don’t have to go all in on red though, a single red shelf could create pop without being overwhelming. 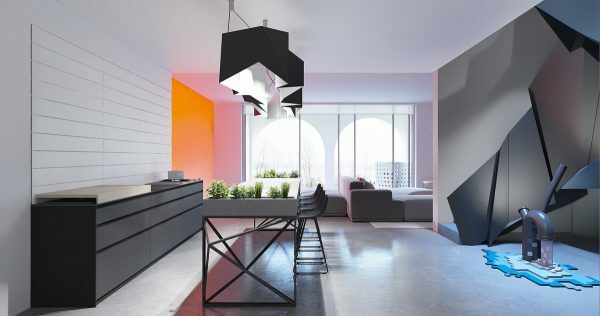 The copper desk lamp in this all encompassing scheme is eaten up by red reflection. Embrace the power of patterns. 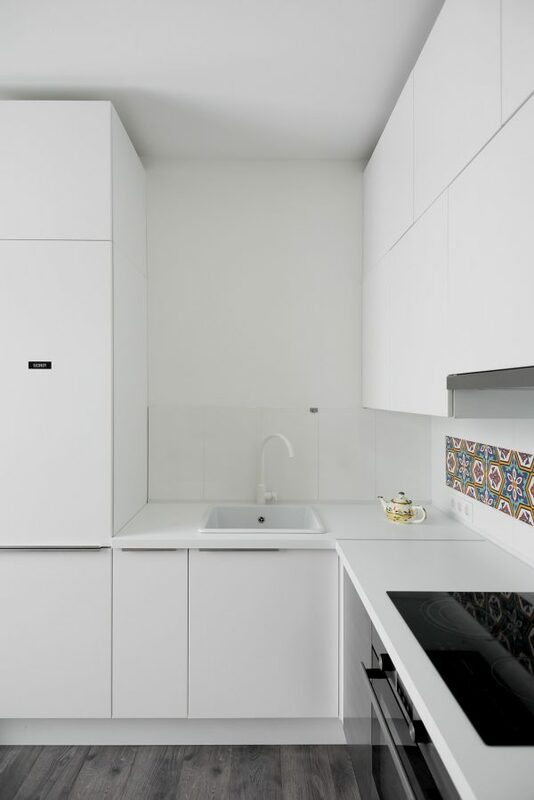 A simple white and wood small kitchen design achieves individuality with drill hole patterned boards. A black framed divide brings in a cubist pattern too. Use every nook and cranny. 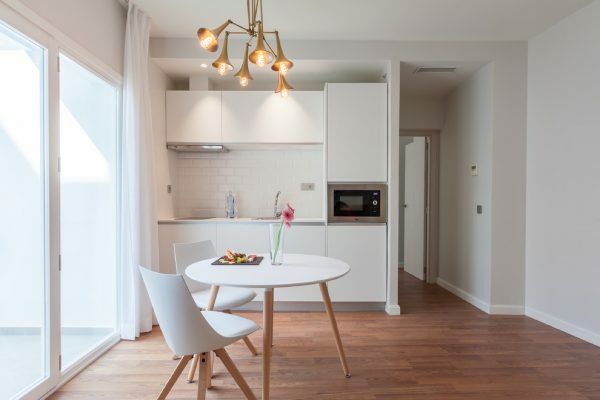 This white and wood kitchen holds a sweet dining nook. 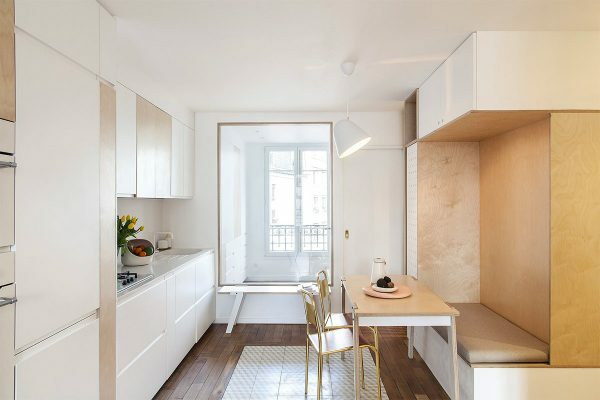 This large breakfast nook is surrounded by extra storage cabinets, opposite the main kitchen run where a modern fruit bowl decorates the bench. Divide and conquer. 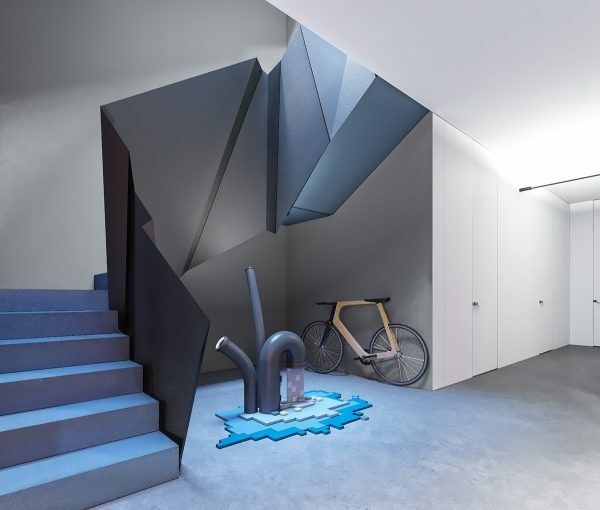 Coloured perspex panels act as a subtle visual room divide whilst allowing light to flow through. Unique storage for wine doubles as a modern art piece. 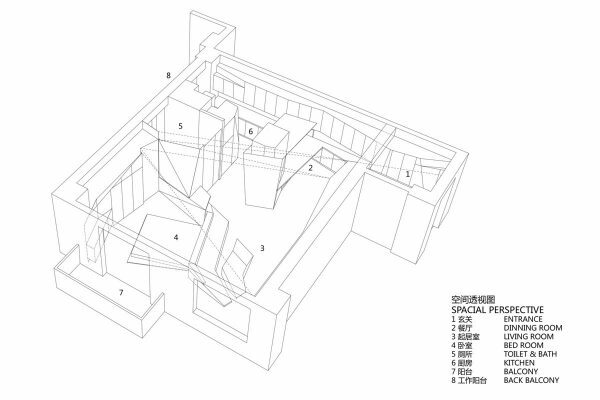 Section off an open plan small kitchen. 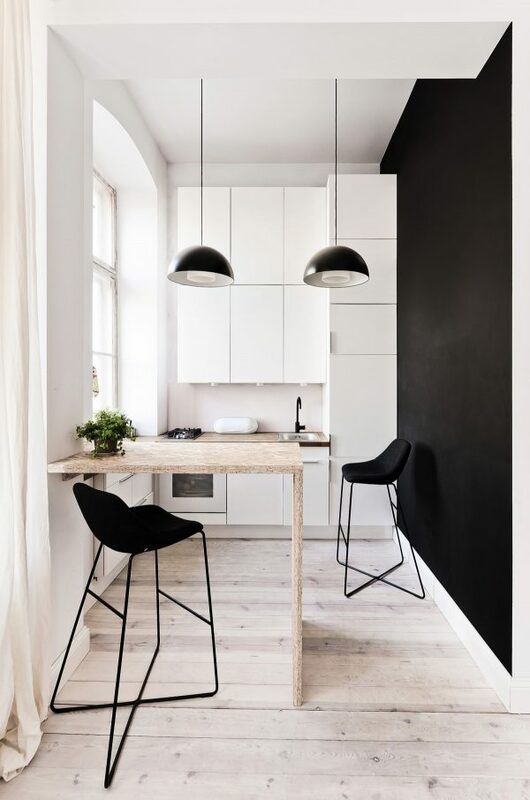 This black, white and wood themed kitchen has a dining bench jutting out that separates it from the rest of the living room. A couple of designer swivel bar stools give the very basic extension an upmarket look. 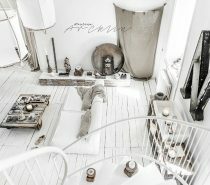 Do not underestimate the importance of beautiful flooring. Indoor plants are a cheap and attractive way to dress your nest, and they clean the air too. 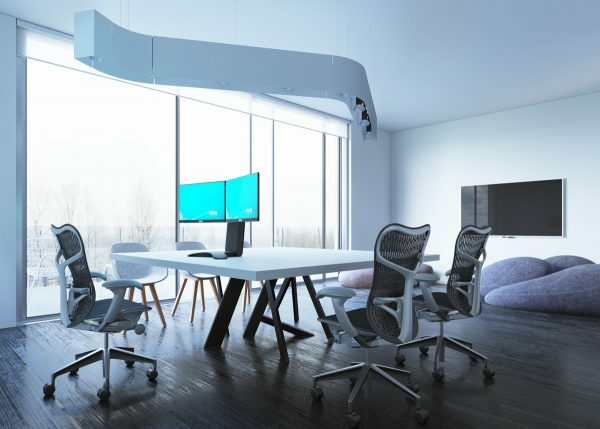 Task lighting is key. 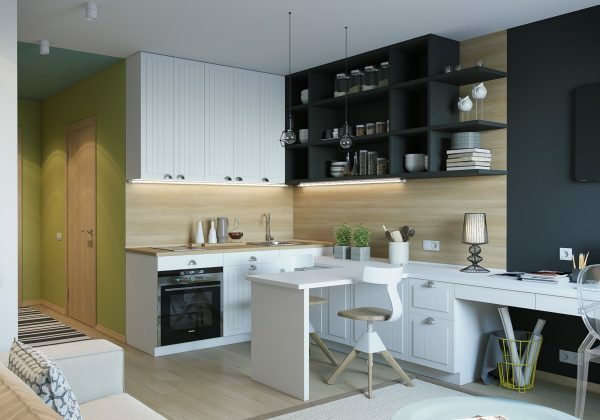 Locate pendant lights exactly where needed by using ceiling hooks. Storage display nooks nicely break up a solid wall of cabinets. Mix and match. This small kitchen table matches the white and wood finish of the cabinets. 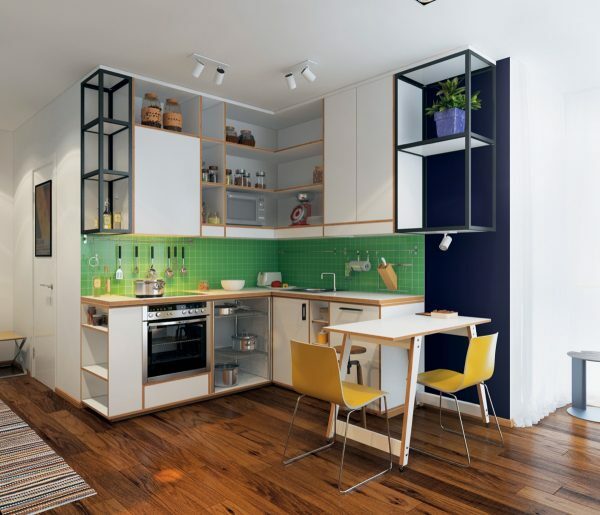 However, multicolour is the order of the day in this green kitchen backsplash, yellow chairs and blue accent kitchen. 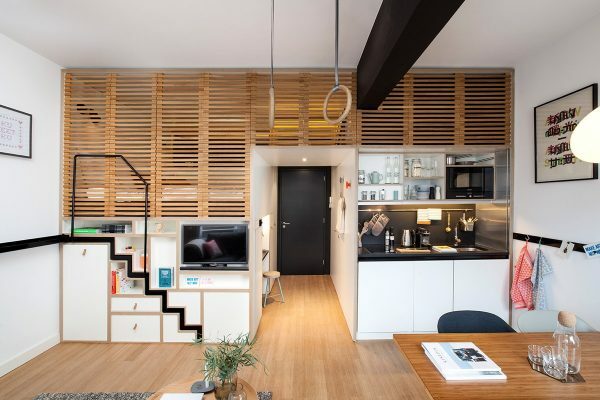 Look at a tiny open plan home as one whole. 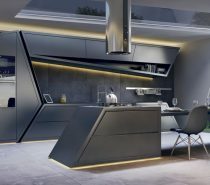 This kitchen decor blends with the dining area, lounge and bedroom. Strictly allocated kitchen storage places are a must. 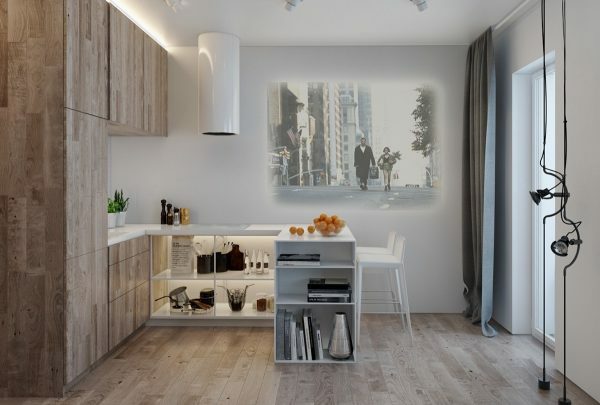 A small tv for kitchen diners is commonplace, but how about a generous projection screen? 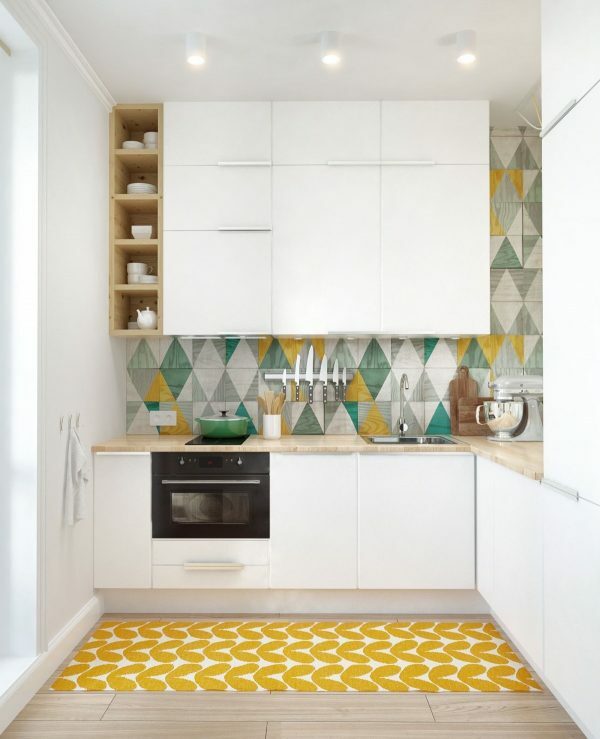 Decorative tile stickers can pull a kitchen colour scheme together. 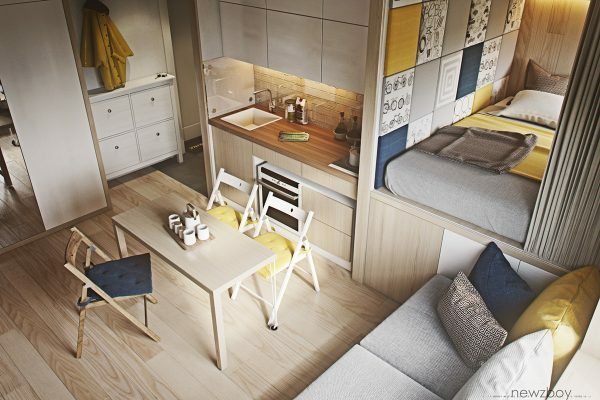 Capitalise on cupboard space. 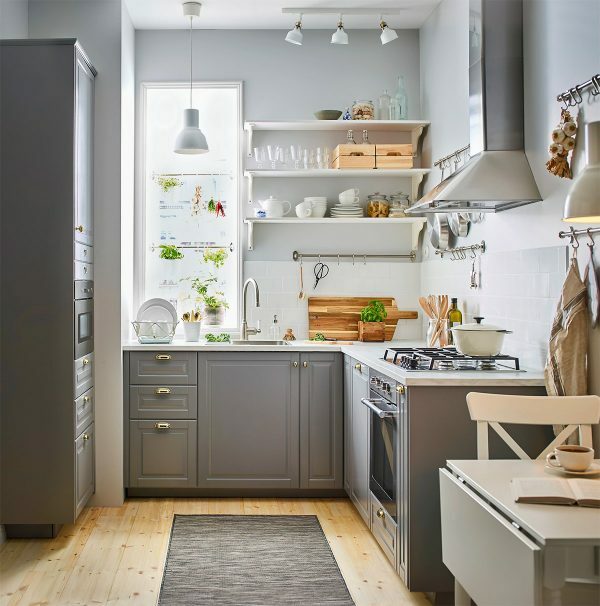 This grey and white kitchen may be small but it holds oodles of storage space. A small blue kitchen creates happy blue sky vibes. 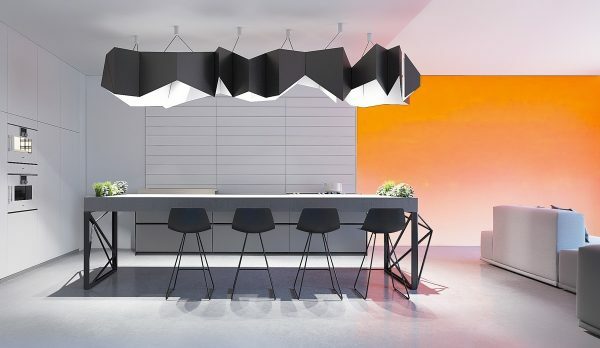 Unique kitchen pendant lights can be the crowning glory to small minimalist kitchens. A small round kitchen table is easy to get around without bumping a hip on a sharp corner. 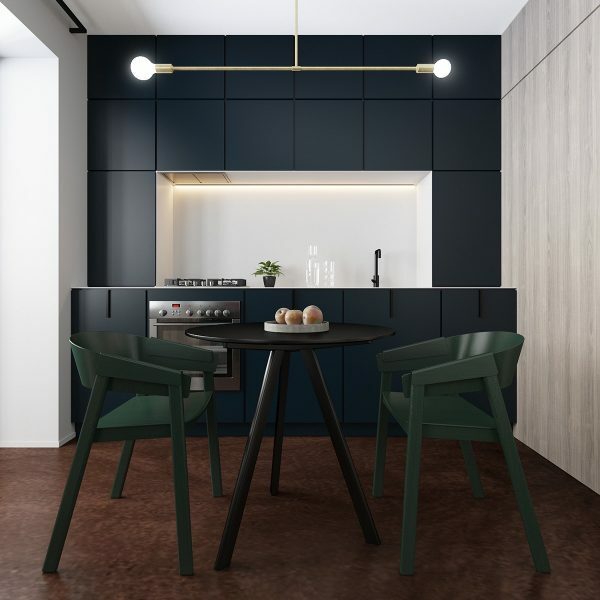 This black kitchen table has been teamed with bottle green chairs to change things up a bit. A modern chandelier cuts through the view of black kitchen cabinets behind.